Marla Lepley-Starr is the lead instructor for the evening Practical Nursing Program at Gaston College in North Carolina. The school offered her the position as a result of her practicum there through the online Master of Science in Nursing Education at UNC Greensboro. Lepley-Starr knew she wanted to be a nurse educator, but finding the right program took time. A variety of programs and formats are available. Ultimately, she says accreditation helped her decision because so many employers look at that. She also liked that the program is well grounded in evidence-based practices, involved in simulation, and in tune with the National League for Nursing and its standards of practice. An online program was a necessity for Lepley-Starr, who worked while she earned the degree. The online platform helped her connect to her peers. Just as students may use social media to connect with friends, they create a Google Hangout, Skype, and share documents for courses. Students form professional and personal relationships throughout the program. “I didn’t feel any less connected with those peers than I did when I went through my prelicensure program back in the classroom,” she says. She got to know peers through collaboration on group projects. One project was to design a nursing program from the ground up. Her group researched the mission, vision, values, campus, budget, bylaws, facilities, and resources of an assigned university. They included an accrediting body, campus building, faculty, and number of seats. “It’s a phenomenal amount of work, but it certainly gives you insight into what it takes,” she says. While earning her degree, Lepley-Starr worked full time as an Assertive Community Treatment Team nurse, part of a group of medical, behavioral health, and rehabilitation professionals working as a team to treat individuals with mental illness. She worked more than 60 hours a week, had a daughter in college, and a young adult son who helped her care for her grandmother with dementia. They managed family time on Skype while doing homework. Lepley-Starr entered the program with 18 years of nursing experience. “I thought that I was pretty skilled to begin with,” she says. But she found there was more to learn: nursing-based research, getting and analyzing data, tools and techniques for evaluation, resources, and communicating that knowledge with others. But Lepley-Starr can continue to add to her experience. She’s looking into terminal degree programs for next year. 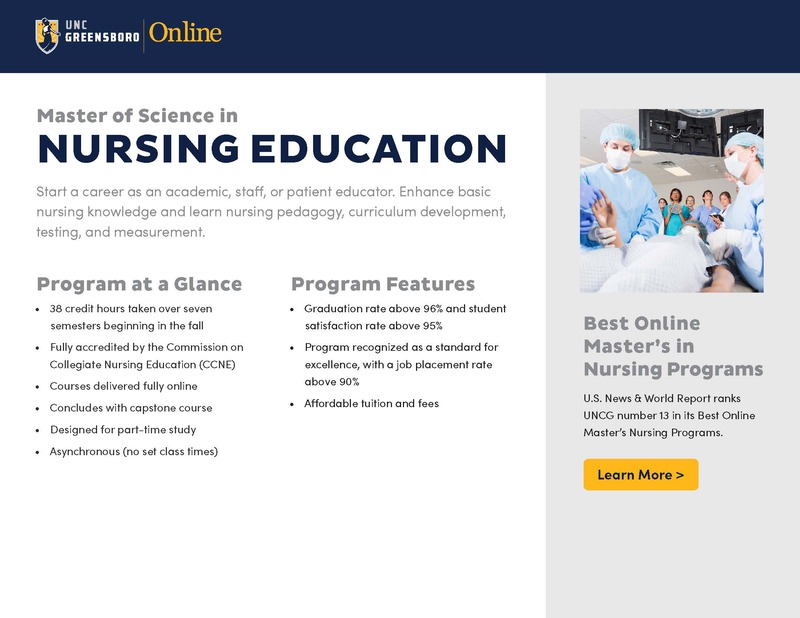 For more about the Master of Science in Nursing Education, download a brochure. Welcome to Ready to Learn! 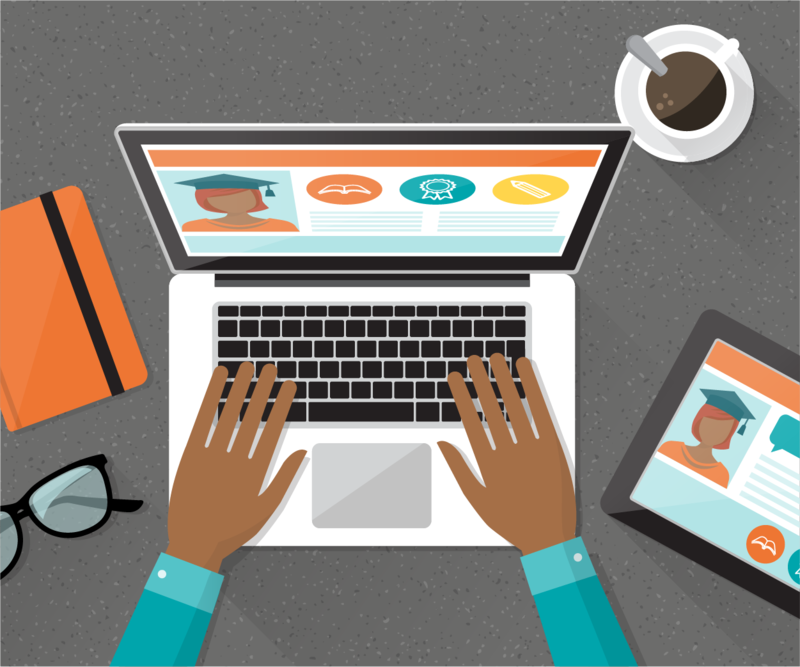 These interactive modules will help assess your level of readiness to take an online course and teach you helpful skills that will enable you to succeed in an online course. If you’re earning your degree online, make sure you’re familiar with some basic technology. You’ll need a computer as well as basic computer skills. Textbooks, notebooks, and pens aren’t your main tools in the online classroom, though they’ll still be part of it.